Did you know you can enroll personnel in live classroom sessions through CentreLearn’s online training system? CentreLearn’s easy-to-use Course Builder and Classroom Sessions functionality delivers an effective way for personnel to self-enroll in instructor-led training sessions and for administrators to track, manage, and record live or hybrid training. Go to Training Manager then to Course Builder on the left menu. Click the +New Course button in the upper right corner. Enter the course information and check Classroom Course in the lower left side. This must be selected at this point – it cannot be added later. Click the orange Next Step button in the lower right side. 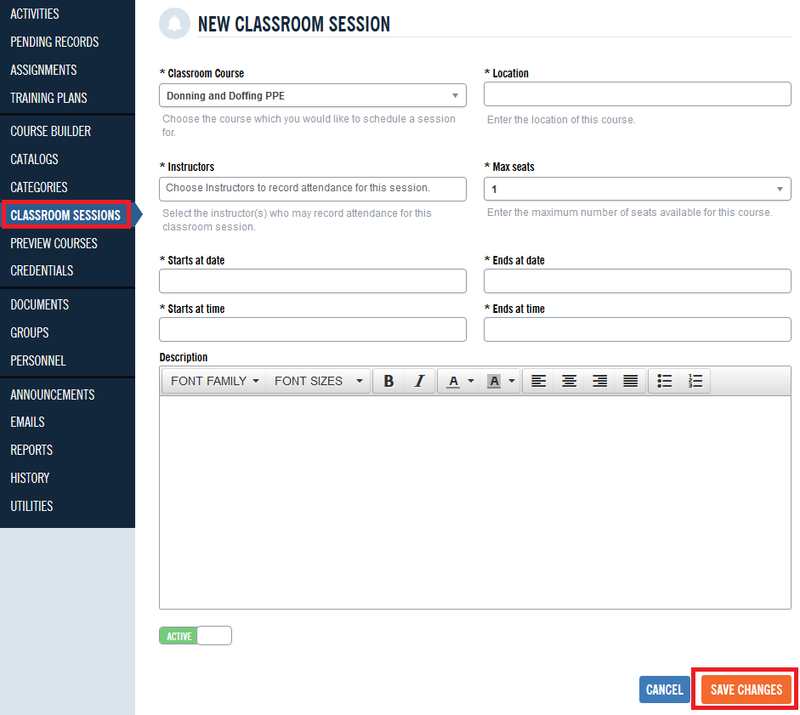 Click the orange Add Course Component button, select Attendance Tracker, and click Select Type. Give it a descriptive title and click Save Changes. 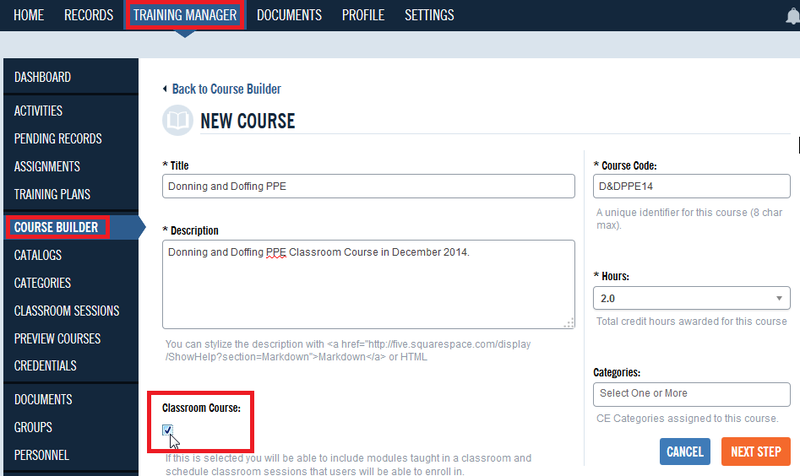 Click the Add Course Component button to add any other course components. Anything added after the Attendance will not be able to be viewed prior to attendance being checked as attending. Anything prior to Attendance may be viewed prior to session. 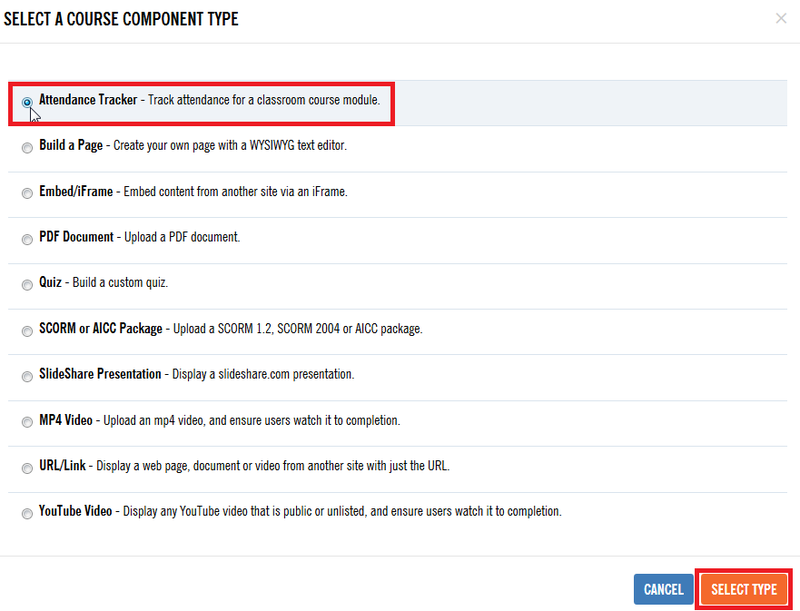 Add multiple Attendance components to create a course experience that pauses for live/in person knowledge/skill checks. Once your course has been built, click the orange Save and Exit button. Under Training Manager, access Classroom Sessions from the left menu. This is where classroom sessions are created and managed, including setting dates, times, and details for the course. Click the orange +New Session button in the upper right side. Choose which course you would like to schedule a session for, enter a location, choose the instructors, set the maximum number of seats, and date/time information. Once you are done, click the orange Save Changes button. Go to Training Manager then access Assignments from the left menu. Select and create your assignment. Courses with classroom sessions are like any other course and need to be assigned for your personnel to view/attend. They also can be added to your department custom catalogs. Users can only enroll for one offering of a course with Classroom Sessions. Personnel click on the assignment’s orange Select Course link. They should then click the blue Enroll button. The date of the session is also listed here. If there are any pre-attendance components, they are able to start the course and view them. By clicking Cancel Attendance, they can unenroll from the course. Once they have reached the Attendance component, they will see the title, location, date/time, and the message, “An instructor must record your attendance in order for you to continue,” if they have not been marked for attending the classroom session. Go to Training Manager and access Classroom Sessions from the left menu. Click on the Enrollments button for your course session. To unenroll a person from the course, click Unenroll. Go to Training Manager and access Classroom Sessions from the left menu. Click on the Edit button for your course session. At the bottom of the page, you will see the Attendance Tracking area where you can click Record Attendance to mark who has attended. Once you have marked all who have attended, click Update Attendance and Save Changes. Four reports are available to help administrators and training officers. The other course/assignment related reports can also be used. Classroom Attendance Exception Report – Used to track who has not attended a specific session. Classroom Overall Attendance Exception Report – Used to show who has not registered for any session of a course. Administrators have the ability to manually enroll personnel in classroom sessions. If a course has online components, a survey must be completed for a user to earn a certificate and complete the course. Personnel that have no set site management roles can be selected as instructors of a course and can manage that particular course, but cannot create new courses or classroom sessions. Classroom Sessions can be made inactive. If a course with attendance components is made inactive, it cannot be selected in the Create Classroom Sessions drop down. Please click here to view a step-by-step tutorial video of how to utilize this application. CentreLearn has now given you the ability to archive your organization’s courses! Read our FAQ’s and step by guide so your training staff can take advantage of this tool. Why should I archive registrations (courses)? Archiving will reset a user’s completion status, making the course available to take again. In order to make a course available again, it must be archived. How does it affect certificates, courses, reports, assignments and training plans? • Certificates and records are not affected or deleted. • Courses in progress are reset to the “Not Started” status. • Reports on completed assignments will not be affected. • Courses available in assignments may change for a user. A previously completed course will become available again. • In order to create training plans for a new certification cycle, courses must be archived so they can be reoffered. Some organizations archive all their courses at the beginning of the year – a brand new year, a brand new slate of courses. Others archive courses for new recertification cycles or based on their annual training schedules. Administrators and those with the ability to “Manage Users” may archive courses. How do I archive courses for my personnel? To archive an individual’s courses, go to Training Manager and select Personnel from the left menu. Click Edit next to the individual’s profile and go to the Courses tab. Click the red Archive Registrations button. For an entire group, go to Training Manager and select Groups from the left menu. Click Edit next to the group you wish to have their registrations archived. At the bottom of the page, click the red Archive Registrations button. Instructor-Led Activities let you track completion of hands-on training or classroom instruction, online courses watched together as a group, or videos viewed as a group from our library of expertly-selected best-of-the web content. Has your organization been waiting to make its move from CentreLearn’s Classic Learning Management System to the all-new CentreLearn Training Management System? If so, please watch this demo video for an inside look at the enhanced system. CentreLearn’s interface has been upgraded to streamline functionality and improve overall user experience. If you have any questions, please contact us at (877) 435-9309. For best viewing quality, please select 720p HD in Settings and Full Screen mode on the bottom right corner of the video. CentreLearn has been acquired by VectorLearning, a leader in online education for a broad range of industries, including public safety through its TargetSolutions brand. As a result of this transaction, CentreLearn has merged with TargetSolutions, which is a California-based company with more than 14 years of experience delivering online training and recordkeeping software applications. Today, more than 2,000 organizations, including fire and EMS departments, law enforcement entities, risk pools, cities and municipalities, and public works agencies, use TargetSolutions to manage training. Customers of CentreLearn will experience no immediate impact by this merger with TargetSolutions. Your organization can expect to receive the same level of outstanding service and web-based training technology as it always has with CentreLearn. You can continue to use CentreLearn to schedule, deliver and track training and compliance tasks. VectorLearning is still determining its integration plans and is excited about the potential of offering TargetSolutions’ courses to CentreLearn’s clients, as well as CentreLearn’s courses to TargetSolutions’ clients, at some point. If you have questions about this merger, please contact us at (877) 435-9309. At CentreLearn we are always looking for ways to improve the online training experience. We have recently made some updates to the Training System which will streamline some processes, consolidate information, and make assigning and approving training more efficient. The home screen dashboard is now organized by assignment status. This makes it easy to see what assignments are overdue (red), in process (white), or complete (green). Personnel can easily replay courses and see progress within training plans at a glance. Personnel can enter their own training records (external CE) for approval by the Administrator, Group Admin, or as a user with permission to Manage Activities. For training completed independently, personnel can enter all of the training details including an attachment of the certificate PDF, scan of a card, or course syllabus. Note: Adding Activity Records is Enabled by default. This feature can be disabled in organization Settings. The updated Training Manager Dashboard allows administrators to review the status of training plans and personnel’s completion at a glance. Notify personnel of new assignments and automatically send email updates when assignments are updated. Send custom warning emails when completion deadlines are approaching. Course Builder navigation has moved into the Training Manager Tab. Functionality of the Course Builder remains the same. Training Plans creation and editing now has its own screen within the Training Manager. 1-Click Reports can now display numbered credentials when the reports are exported, allowing for easy import into other systems. The updates also included improved user experience in older versions of Internet Explorer (IE), but we still recommend using modern, up-to-date browsers. Learn more about these updates and watch a video tour. Register for upcoming Admin Training. If you have any questions about these updates, feel free to contact us any time. Customer Support is unlimited and included with the Training System. Pediatric courses offered by CentreLearn. CentreLearn content partner, 24-7 EMS, announces two new CECBEMS-accredited courses for EMTs and paramedics on acute and chronic renal failure. The entire 24-7 EMS catalog, including these courses, is available for a low per person per year cost. Once the 24-7 EMS catalog has been shared with your organization, courses can be assigned to personnel. Acute renal failure (ARF) is a life-threatening condition that can develop in a matter of hours or days. Fortunately, with appropriate and rapid treatment, it is reversible. As an EMS provider, you can help to improve outcomes for patients with acute renal failure with early recognition and treatment. This program reviews the basic anatomy and function of the kidneys, what causes acute renal failure, and care to provide in a prehospital environment. Chronic renal failure is a condition that affects nearly all the systems in the body. Patients with chronic kidney disease or end-stage renal disease can experience many different types of complications that are caused or exacerbated by renal failure. As an EMS provider, a basic understanding of chronic renal failure and its causes can help you to better recognize and provide care for these related complications. This program reviews the growing rate of renal failure incidence, how renal failure occurs, how to recognize renal failure, complications related to dialysis, other illnesses related to chronic kidney disease or end-stage renal disease, and care to provide in a prehospital environment. To add 24-7 EMS courses to your CentreLearn Training System, or to learn how your department can use online education to reduce costs and save time, contact us or call 877-435-9309. All CentreLearn courses are written and designed by experienced field providers that are also expert educators and parents. Courses are reviewed by a board certified emergency physician, CECBEMS accredited, and where applicable, state approved for EMT and paramedic continuing education. Describe the clinical situations that require the use of basic and advanced airway techniques. Explore pediatric airway anatomy and physiology. Review the appropriate use, advantages, and disadvantages of various airway devices. Discuss capnography and pulse oximetry and their use in pediatric patient assessment. Identify the primary cause of pediatric cardiac arrest and the primary cause of preventable death in the pediatric patient. Identify the signs and symptoms and explain the pathophysiology of respiratory distress, respiratory failure, and respiratory arrest. Describe the general assessment and management of pediatric respiratory emergencies. Describe and explain the assessment and treatment for several causes of pediatric upper respiratory emergencies: croup or laryngotracheobronchitis, epiglottitis or acute supraglottitis, and foreign body aspiration. Describe common medical causes of pediatric lower airway emergencies including: asthma, respiratory syncytial virus/bronchiolitis, and pneumonia. Describe uncommon medical causes of pediatric respiratory emergencies including: Guillain-Barré syndrome, metabolic acidosis, bronchopulmonary dysplasia, acute chest syndrome of sickle cell disease, and cystic fibrosis. Discuss relevant pathophysiology associated with these medical causes of pediatric respiratory distress. Watch for announcements regarding the availability of these courses in an upcoming blog post, in the Train Better Memo, or on the CentreLearn Facebook page. The CentreLearn Training System always includes the entire EMS and Fire course catalogs. Begin training online immediately with hundreds of hours of accredited online training videos for EMTs, paramedics, and firefighters. CentreLearn partners with 24-7 EMS, 24-7 Fire, Medrills, Emergency Film Group, HIPAA TV Online, and Physio-Control to offer hundreds of additional courses to fulfill EMT, paramedic, firefighter, fire inspector, and fire officer training requirements. Visit the CentreLearn courses page to learn more about CentreLearn’s content partners. Training officers can either assign courses to their personnel or provide them access to the EMS and Fire course catalogs so they may complete pediatric and obstetric courses on their own schedule via the CentreLearn Training System. Individuals can access all CentreLearn CECBEMS-accredited EMS courses and dozens of other courses on fire suppression topics through RapidCE.com. Train Better. Spend Less. CentreLearn.